Nick Adams has entered into a Higher Level Environmental Stewardship agreement with Natural England. Environmental Stewardship helps the owners of historic sites to enhance and protect the natural and historic environment and provide public access. Natural England has paid for two A0 size interpretation boards, one at the top of the site right by the fence, and one to the North of the bath house. The boards, which were designed by Jeremy Cooper, will add great value to any visit to the site. Anyone guiding a group visit will be able to use the boards to help to explain what was there - and for those who wish to read for themselves, there are brief explanations on the boards. Click on the photo to see a larger image of the board. 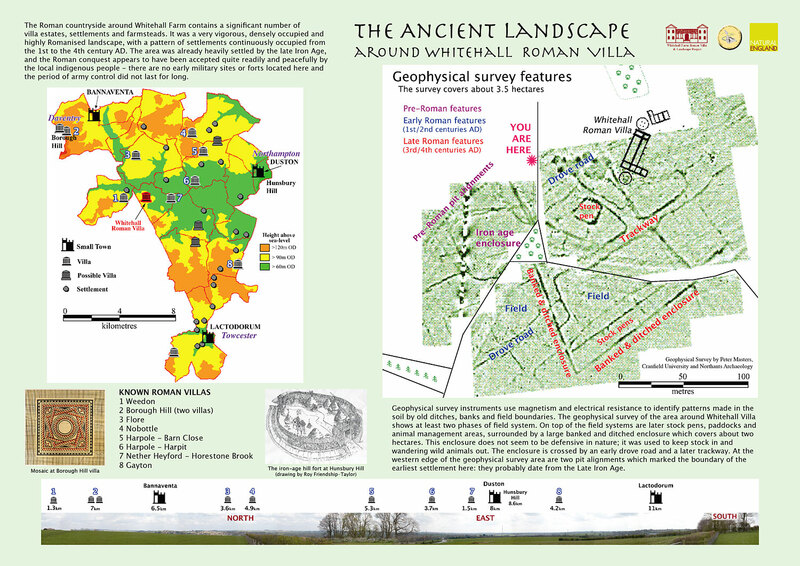 The board by the entrance to the site is about the ancient landscape surrounding Whitehall Farm. It's main components are a map of nearby villas and other ancient sites, and the geophysical survey map of the site. Roy Friendship-Taylor gave us permission to use his illustration of the Hunsbury Hill settlement, which features on the interpreation board there. There is also a photographic panorama of the view if you are standing at he board (although the board itslef it not included!) showing the direction and distance of nearby settlements. 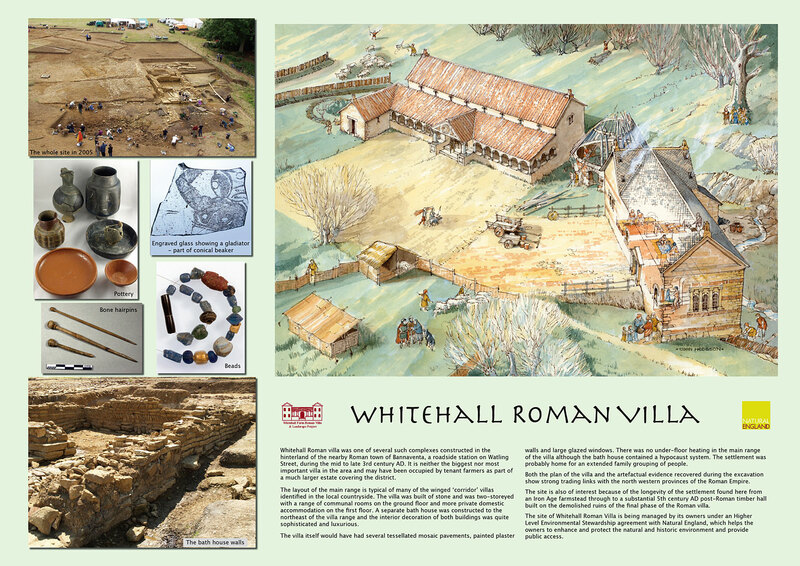 The board by the villa features the specially commissioned illustration of the site by Dr John Hodgson, who is one of Britain's most emminent archaeological illustrators. This illustration is the centrepiece of the home page of this web site, with a linked gallery of detailed views of it. Click here to visit John Hodgson's website.